"The army has to protect us and not the Arabs," said a resident of the area. "In the last week, the security forces have protected the Palestinians to show that we are an 'enlightened state.'" 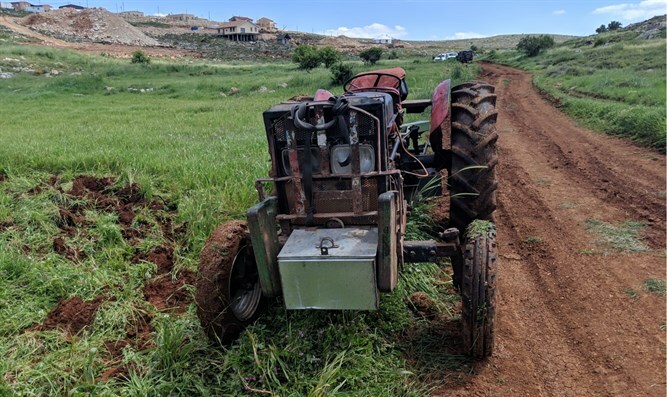 "The security forces even caught three Palestinians who photographed the settlement under the auspices of the agricultural work and released them without doing anything with them. We remember that one of the terrorists who murdered the Fogel family took part in an olive harvest near the fence in Itamar, shortly before he left to carry out the attack, and we are afraid that such an incident will happen here as well." Attorney Nati Rom, a resident of the region, also expressed his concern: "Arabs come here under the auspices of the security forces and photograph the settlement. It's total madness. No matter how much we warn, the security forces prefer to submit to the dictates of radical left-wing organizations, which endangers our lives." In addition, Adv. Rom said that the Israeli police defend violations of the law. "The Arabs use agricultural tools without identification plates and without registration, and they are even suspected of stealing. The Israeli police deliberately closed their eyes and the brigade commander even allowed them to work in the sector without license plates. This is a scandal, certainly considering that the traffic police detain Jewish residents 500 meters away every day." According to Rom, he filed many complaints, and if the police does not deal with the matter, he will submit a complaint to the High Court of Justice: "On Sunday I intend to send letters to the Minister of Public Security, the Deputy Police Commissioner and the OC Central Command. If the security forces will not act legally, we will turn to the High Court of Justice."